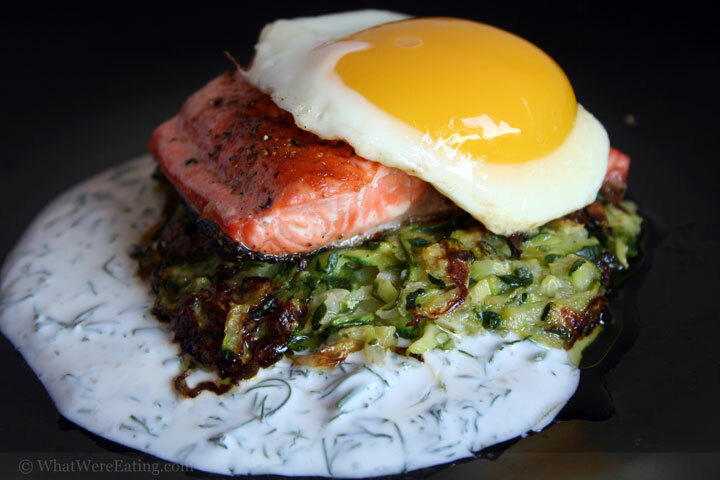 Tonight we’re eating a dish formed by layering lemon dill cream sauce, a zucchini pancake, fresh seared sockeye salmon and topped with an egg cooked sunny-side up. T: wow dinner tonight was excellent! A: thanks T! I’ve been trying to think of a visually pleasing egg dish for a while and finally decided just to make whatever came to mind. T: ahh well that seemed to work! Everything really melded together, and each item was tasty by itself, too. I loved it. A: sometimes i find that eggs can seem a little heavy, but i tried to lighten this up by using a lot of fresh flavors like the lemon, dill and salmon. I really enjoyed tonights meal myself. I probably could have eaten two of them! T: it was quite fresh. not heavy in the least. I could have continued eating plate after plate. Could you go make me a few plates of it? A: hehehe… probably, actually. I have more of all the ingredients, although i froze the rest of the salmon fillet i bought today. I decided to buy a whole “half of a salmon” fillet today, so…. more salmon in the future! T: hell yeah I love salmon. This salmon was incredibly salmon colored. Do you think they used dyes? A: it’s very possible, they frequently do. The packaging didn’t mention any dyes though, so maybe not. It’s supposedly wild sockeye salmon… but i never believe everything i read. T: hell I don’t believe anything I read. Have you ever seen salmon packaging that mentioned dye? A: i have actually. even the non-vacuum sealed salmon (you know… the plastic wrap kind) has had the “dye added for color” part of the label. T: so it’s like the cereal boxes that say “enlarged to show texture” except that instead of photoshoping the photo they inject my food with chemicals. nice. A: yup! you hit the nail on the head, son. In a perfect world i would be wealthy enough not to have to shop for fish at the von’s, or any grocery store for that matter. sadly on my (and your) current salary, we can’t afford that. Gorgeous, guys! I will definitely be making this once you all get the recipe up. Also, I started making your panzanella the other day–I say started because I got totally off track and ended up with a completely different, but delicious, salad. So, thanks for the inspiration? Also, my favorite restaurant here makes a mango ice cream mochi that makes me speak in tongues it’s so good. Put an egg on anything and I’ll love it. I’d never even thought of putting egg on fish!!!!!! OMG I’m drooling here! BTW…. send me some mochi ice cream.. ironically its been a bit of a personal mission of mine to try to find them locally! =( to no avail! Ugh…mochi…so pretty but I cannot abide the taste. Maybe I’ve only had bad mochi? Where do you get the good stuff? Don’t forget…I’m moving to San Diego soon! gagatka, I’m glad you enjoy it! it was very simple to make… i’ll try to get the recipe up soon, although you can always just use it as an idea! Marianne, i’m happy to hear it inspired you… i always go into making a dish with a certain thing in mind, then by the time i’m plating, the meal has taken some turns and twists. The creativity is the best part about cookign for me! and i swear… i’m gonna get this recipe up soon! Lea, I agree…. amanda+eggs=goodness. Seriously, i love eggs. i think tyler got kind of sick of them at a previous job, but he wasn’t complaining last night! have you tried a local asian market? generally they have them in the freezer section! I wish i could send them w/o them melting! Michellephant, we are excited to have you in SD soon, you will definately have to come to dinner some time, maybe stay around for some guest blogging! is it the glutenous rice that you can’t stand or the delightful centers??? they definately grow on you! How could I not stand something described as a “delightful center”? It must be the glutenous rice. I’ve had them when I was young and then once again at a conveyor belt sushi place called East here in Manhattan. A place that serves sushi on a conveyor belt is probably not the best place to go for mochi! I just love your blog., I’m stationed in Germany, and this blog is so nice since I’m from Los Angeles…May I ask what kind of camera you use for these lovely pictures? Thanks Denise! I’m gonna try to get the recipe up tonight! BTW, you should change your site to allow comments from people other than just people with blogger blogs! I would totally leave comments if you did. Lea, how far are you from orlando? depending on the craving i would drive pretty far for them! Laura, I’m so glad you enjoy our blog! Do you get to eat bunches of german delicacies like sausages and wiener schnitzel?!? We use a canon digital rebel, so we get all the perks of a digital camera with all the function of a SLR! I am a freak, because I love glutinous rice, and I did right from the start. Thanks for the recipe, I think I’m going to make this for my parents this week. You people with your digital SLRs make me so jealous! I do the best I can with my nice little camera, but I still get all envious. I think it was love at first site for tyler and the glutinous rice too. I thought it was a little weird the first mochi, but by the second i was hooked! We are so lucky to be able to use a DSLR! It was tyler’s college graduation present from his mom. I would never be able to afford one. and let me just say mariann! you put out some damn fine pictures with your nice little camera! Hey guys. I know all the readers will be excited now that T is back in town. I think you should try a sushi recipe next. Amanda and Tyler – that looks great! Seriously, it seems like putting an egg on almost anything just raises it to the next level. The other day, we ate leftover Chinese with a sunny-side up egg on it. (This is what happens when the husband has free rein in the kitchen.) Even that was completely awesome. Glad you’re all settled in! Thanks Girlie! we are happily settled in (two and a half blocks from the pacific!) it really is amazing what an egg (and runny egg yolk) can do to just about anything. and btw, at least your hubby is in the kitchen at all! 😉 jk, T! Love love love love your site!! I guess you never got a change to put this recipe up yet eh? BTW, made the pork tenderloin and the Serrano Ham and Kiwi Bruschetta last night, they were both AMAZING!